Information about The Taimu CD here! Taimu shakuhachi are long, wide bore flutes with a deep, airy, expressive tone. I've been working closely with Brian Tairaku Ritchie for a number of years developing this particular style of shakuhachi. My concern when building these flutes is finding a 'glowing' tone quality. This glow is very different than the focused, pure tone of thinner bored shakuhachi. 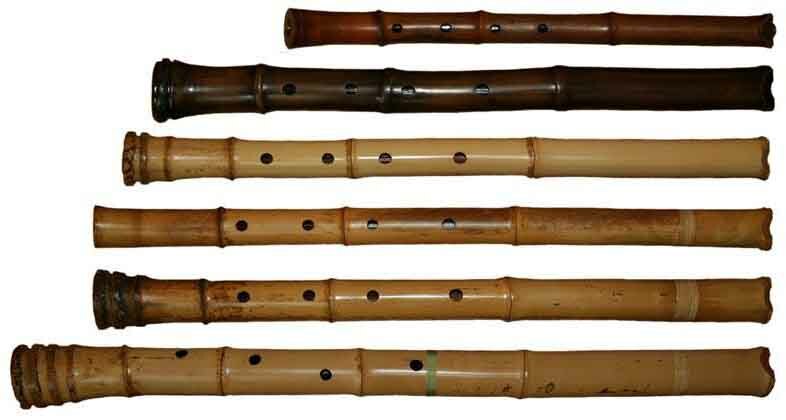 This flute design is characterized by a wide bore, which gives the flute its natural, raw, windy tone. The holes are also relatively large and sharply undercut to smooth the playability and open up the volume. The design approach is minimal. There is no utaguchi and little or no ji paste added to the bore. Bores are lightly coated with urushi as a functional addition. This helps protect the bamboo from climate changes. It also slightly increases the tone projection of the flute. The term Taimu seemed to be a logical name for this style of flute. It was formed by combining Brian's professional name Tairaku with Mujitsu Shakuhachi. Taimu can be loosely translated as "The Big Nothing." Please contact me for availability or to reserve a flute. Taimu Instructions and Playing PDF. Level 1. Cornelius Boots. 19 pages.